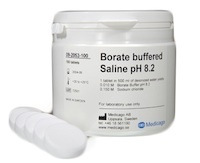 Borate buffered saline (BBS) is commonly used in coating procedures for ELISA and as a component in blocking solutions for Western blotting. The buffer can be used as a sample diluent in biological studies and for various applications within biology and biochemistry to maintain the pH. Medicago’s BBS buffer tablets are exactly pre-weighed and supplied in a pack size of 100 tablets, each tablet giving 500 ml of 0.15 M sodium chloride, 0.01 M borate buffer with pH 8.2 at 25°C when dissolved in deionized water. Deposit one tablet in a laboratory flask or beaker placed on a magnetic stirrer. Add 200 ml of deionized water and stir the solution for a few minutes. Adjust the water up to 500 ml, stir until full dissolution and the buffer is ready to use. BBS buffer is shipped at room temperature. Store the tablets in a dry place at room temeprature. Shelf life is four years after production date.